(NaturalNews) The results of a new study published in the journal Stem Cell Research & Therapy suggests that the popular ancient Indian spice, turmeric, could help repair the brain following an injury and could also be used to treat neurodegenerative diseases. In order to examine the effects of turmeric on brain cells, scientists first bathed endogenous neural stem cells (NSCs), which are stem cells found within adult brains, in extracts of a chemical found in turmeric. Amazingly, they observed up to 80 percent more stem cell growth when compared to the control, which used no chemical. Now, we all know that turmeric offers many health benefits for people, including the ability to cure and treat many diseases without side effects. Multiple studies have shown that cholesterol medications, antidepressants, pain and inflammation medications, some diabetes drugs and many others, can potentially be replaced by the ancient spice. As remarkable as that sounds, it's even more exciting to learn that turmeric can possibly help repair brain damage in humans, following events like head trauma or stroke. Taking the experiment one step further, researchers injected aromatic ar-turmerone (a chemical extract of turmeric) into part of a rat's brain and witnessed "similar increased growth and proliferation of stem cells into neurons," according to the study's co-author Dr. Adele Ruger. Through PET imaging, scientists discovered that the subventricular zone (SVZ) was wider, and the hippocampus had expanded in rats that received the turmeric injections. This is quite significant considering the SVZ and hippocampus are "the two sites in adult mammalian brains where neurogenesis, the growth of neurons, is known to occur," scientists say. Within reason, the brain has advanced capabilities it terms of repairing itself, a process made possible by neural stem cells. NSCs transform into neurons and two other types of neural cells upon stimulation, which contributes to brain restoration, . Previous studies have shown that "boosting NSC numbers contributes to better regeneration after [for example] stroke in experimental animals," said Ruger, who is also a researcher at the University Hospital of Cologne, Germany, and the Institute of Neuroscience and Medicine. Researchers say ar-turmerone prevents microglia cells from activating. If activated, these cells contribute to neuroinflammation, which negatively impacts the brain and is associated with different neurological disorders, according to previous studies. Based on these new findings, scientists suggest the spice could be used to effectively treat degenerative diseases like Alzheimer's. "While several substances have been described to promote stem cell proliferation in the brain, fewer drugs additionally promote the differentiation of stem cells into neurons, which constitutes a major goal in regenerative medicine," said Ruger. "Our findings on aromatic turmerone take us one step closer to achieving this goal." In addition to brain restoration, ar-turmerone has other benefits including antimicrobial and antifungal properties. It's believed to help keep the liver healthy, and can even be used as an antivenom. 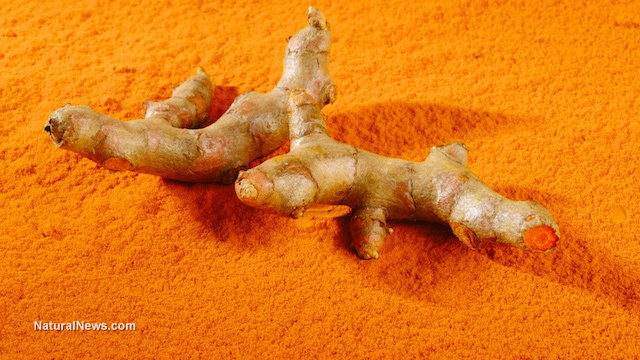 Another extract of turmeric, curcumin, is much more widely studied and known for reducing inflammation and offering strong antioxidant abilities that fight free radicals in the body, which are believed to contribute to aging and disease progression, according to Authority Nutrition. Scientists say curcumin also helps improve brain function, lowers the risk of brain diseases and specifically promotes growth of a hormone responsible for preventing depression and Alzheimer's disease. Brain-Derived Neurotrophic Factor (BDNF), the growth hormone responsible for brain function, is increased by curcumin. Scientists believe increasing BDNF can delay or reverse brain diseases, improve memory and make us smarter. With each new study discovering more of turmeric's health benefits, it's likely the research will advance towards fully understanding this spice's incredible capabilities.